The bibliography of this period is “Seventeen”, by Alaric Jacob, in which the present writer regrettably appeared characterised in terms which are alternatively fulsome and revolting! The first part of this book, which was very well reviewed, written when Jacob was seventeen, gives a very clear idea of the indisciplined hurly-burly for the period under noted. In September 1918, just before the conclusion of the war, the staff of Masters was, with three exceptions, deplorably inefficient; all sorts of queer creatures, whose academic distinctions were in some cases as shady as their morals, were in charge. Few of them could teach; few of them could keep order. There were three outstandingly fine teachers in 1919. F.J. Rosenberg in charge of the Army Class; a brilliant mathematician and scientist and a brilliant teacher; he also took “Form Science” in three other Forms in Upper School. He had an amazing faculty of expression and description which impressed itself on and secured attention from the most vapid and reluctant pupils, who became interested in spite of themselves, in Botany, Physiology and Astronomy. Rosenberg’s teaching of these subjects, backed by his wide knowledge and reading, was remembered word for word more than thirty years later by the boys. C.C. Lloyd-Jones (“Jaggers”), son of Archdeacon Lloyd-Jones of Bangor (still living) taught Classics to the Sixth, greatly loved for his deliciously dry and, at times, caustic humour, and did a good deal of coaching on the river. His blistering comments to inefficient “tubbers” on the Upper Reaches of the Stour more often than not resulted in the rowers being so convulsed with laughter that rowing became completely impracticable. W.N. 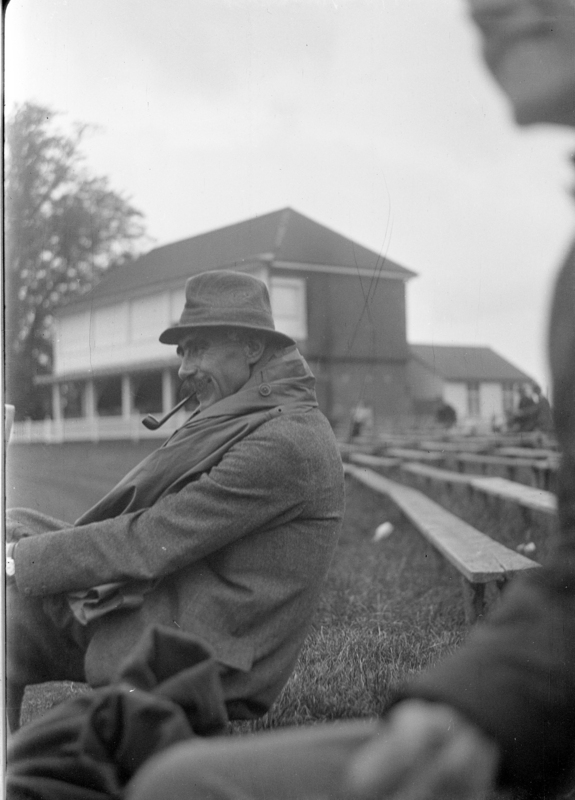 Goss (“Nat”), who spent most of his life at K.S. was a fine teacher and took immense pains, particularly with his less brilliant pupils. No trouble was too much for him to take, and, although a strict disciplinarian and unpopular in his early time at King’s, he instilled great affection in the boys under him, and died in 1954, in the house to which he retired in the Precincts. During the Head Master’s serious illness in the “20s” Goss, as Second Master, acted very ably as Head Master in most difficult circumstances. Of the enfants terribles among the Masters, mention must be made of Harold Goodburn from Liverpool University who came to King’s after returning from South America to teach Science. This man’s manner and temper were overwhelming and alarming. He never hit anybody, but the fear and terror which he inspired in many boys was unbelievable. He appeared to have a complete contempt for the School and English education and it must be admitted that Science in those days was generally regarded as a means of passing the hours with a minimum of work and a maximum of malodorous enjoyment. He ultimately married, as his second wife, Miss Stella Wills who for many years was Matron on the Grange side and, incredible to relate, there is every reason to suppose that he is as happy as she is satisfied. Another curiosity was Captain F.W. Hosley, a most charming person with a wealth of amusing stories outside the classroom, but in class another terror not only to the evil-doers but also to those who did well. He taught French with the accent of Stratford-at-Bow and dealt out impositions with such a liberal hand that, in those days of paper shortage, the Head Master had to call upon him to restrain his impetuosity. Translating French to Hosley was an unnerving business. He insisted on a French not spoken in France on being translated into an English not spoken anywhere. He never wanted French translated into good English, but always completely literally. No doubt this ensured that the translator knew what he was doing, but the result was execrable. Hosley died tragically – suicide –but he inspired a certain affection in spite of his ferocious manner, which he shed from him completely with his gown. One remembers also a Parson who must be nameless, who came with forged degrees and after preaching a series of sermons on the importance of Truth, was heard by a small boy being summarily dismissed by the Head Master as a complete impostor. Algy was so straight himself that he was reluctant to believe ill of anyone, and was a poor judge of character. One other twerp must be mentioned, J. Hind, a sadistic bully of about 4’6″ in height, who delighted in giving pain, mental and physical, to such an extent that F.B. Tomkins (6’6″ in height), squared up to his rostrum, removing his coat, and asked him blandly if what he really wanted was a fight! The situation may be imagined; Tomkins got twelve of the best from Algy but Hind left at the end or the term. No mention of Masters at this period would be complete without reference to Percy Godfrey who taught Music. A brilliant pianist; a lover of Wagner; he was an eccentric of the first water; a fine swimmer and cricketer and completely devoid of manners. At a Concert in the Parry Library to which the Head Master’s guests arrived in full evening dress, Godfrey, who loved to shew his contempt for authority, turned up in a Norfolk suit and riding boots. One Master, whose religious proclivities “browned off” many of his charges, was the victim of a sad experience. He occupied two rooms in the Grange with doors opposite one another. Somebody put carbide in his bedroom china, and, having seen that he was safely installed for the night, tied the handles of the two doors together in such a way that he was unable to effect egress from the miasma which his secretions had created. Academically, it must be admitted that during the Head Mastership of Algernon Latter the School sat very lightly to any sort of learning. It was “not done” to work. Latter himself, except for a brief period at Oxford and two years schoolmastering at Felsted, had been at King’s since the age of eight, and for him all was well in the best of schools. The truth is that his attitude was almost completely that of the caricature of what is regarded as the “public school” type. He was a bad teacher, impatient and sarcastic, and never got the best out of people in consequence. As a man he was charming and profoundly kind and to his personal generosity the school, always a poor one, owed its survival during those years. He loved the school with a passionate devotion and served it, according to his lights, magnificently, but he was not interested in learning. The sacred principle of delegation meant nothing to him, and all things going through his hands, it resulted in a severe break-down in 1922. Algy was “Housemaster of the School House” and just after the 14-18 war the food was pretty bad. One Sunday, a hundred boys were given pumpkin pie for lunch; this unusual delicacy when it appeared was most revolting to look at and to taste, and a hundred plates piled high with the yellow mess, reeking of the unmistakable odour of decaying vegetation, garnished the mid-day lunch table. Algy was furious; his lady housekeeper in tears. Boys and Masters hurried away from the scene with averted gaze; some who had rashly partaken of the dish to rid themselves noisily of their stomach’s unaccustomed burden and this was the beginning of the “great food row” which lasted a fortnight. Algy, thinking as usual that nothing could be better in his School, was genuinely hurt. A cross-section of boys was invited to his Study to express their complaint. One, more courageous than the others, informed him that the anger of the House was directed, not at him, but at his lady housekeeper whom, they were convinced, was feathering his, that is Algy’s, nest at the expense of his pupils. The explosion which resulted surpassed belief and was really very funny. Algy decided to reduce the whole thing ‘ad absurdum’ in the manner of the Army; two Monitors stamped round the Old Hall after each meal carrying little notebooks and pencils inviting complaints. At the end of a week it became apparent that all was, inevitably, well again with the food of the School and nothing ever happened after all. During this period I believe only one open Scholarship was gained at the Universities. This was a Musical Scholarship and was treated with the contempt with which in those days, generally speaking, the Arts were regarded. The boy who gained the Musical Scholarship was clearly slightly abnormal and moreover, being no good, much, at games, the abnormality appeared conclusive. The announcement of the Scholarship from the second step of the Memorial Court (a practice which began at this time) was greeted with a roar of laughter, but a half holiday. Rugger coronat opus semper! Of the bloods of this time, among athletes: R.H. Juckes, afterwards a Rugger Blue; P.R. Wace, grandson of Dean Wace, got his Blue rowing at Oxford; C.H. Gibson, Rugger Blue at Oxford; F.R. Tisdall, a fine all-rounder; B.T. Wace, brother of P.R., Rugger and Long Distance runner; J.M. Cameron, Long Distance runner; C.H. Gadney, much in demand now as Referee and Rugger Coach; are familiar names. R.H. Breffit, a brilliant Pianist, hopeless disciplinarian as a monitor, has now achieved fame, incredible to relate, as Chief Constable of Sussex. Alaric Jacob, author of “Seventeen” and other more mature books, achieved a good deal of notoriety by the latter when a War Correspondent and while in Russia became irredeemably tainted with the virus or Communism. Carol Reed, a nonentity while at school and who left early, has now achieved fame and is better known as Sir Carol Reed, Producer of Films. L.H.B. Roberts, now I believe an Architect, was a delicious caricaturist. In the Sixth under Lloyd-Jones, it was his job to draw pictures of the more fantastic and fatuous mistranslations of people – one of his best depicted a young lady with flowing, bright yellow hair apparently engaged as a milkmaid, groping beneath the belly of an apprehensive looking tiger, someone having translated ‘fulviam Ganymeden mulcantem tigres’ as “tawny Ganymede milking tigers”. During most of this time the Religion of the School was completely identified with that of the Cathedral with the exception of the Sunday afternoon Chapel Service held in the South Transept. About this Service there was a feeling of reality. It was popular and enjoyed. The sermons to which we listened were almost exclusively moral harangues – “play hard, play up and play with a straight bat”. The present writer has no recollection whatever of receiving any dogmatic or specifically religious instruction during the six years that he was at King’s. The School went to Mattins on red letter Saints’ Days and on Saturday afternoons to Evensong; on Sunday morning attending full Cathedral Service – Mattins, Anthem, Litany, never less than twenty-five minutes’ sermon and the Ante-Communion to the end of the Prayer for the Church Militant. Never once can the writer recollect the preacher taking account of the fact that 80% of his listeners were school boys. The history of the Chaldaeans, the subversive activities of Assyria, more often than not were the theme of the lengthy sermons, and it is true to say that for the vast majority of boys at the School at this time, whatever religion they arrived with was extirpated by the time they left. The Chaplain throughout this time was a Mathematician who had his eye sideways on Religion; classes of preparation for Confirmation were brief and perfunctory, and the private interview at which “a good straight talk with your Father, my boy, would probably do you a world of good” was merely the opening gambit to a discussion on the state or the School’s Rugger. The Tuck Shop, which is now a Chapel, was under what is now the Library. This was presided over by Mrs. Benn, a Postman’s wife, whose cheery good humour and kindly patience endeared her to a long line of customers. On Saturday afternoons new boys were excused Cathedral and had to attend the Recruit Squad of the O.T.C. At the end of the war Sergeant Major Cheale was in charge, a much loved old sweat, ex The Buffs. He had a fine flow of coloured epithets for the awkward children who sought to form fours for the first time; his rousing shout “You are just a bloody lot of savages”, coincided with the unexpected arrival of Algy and a smiling “Steady, Cheale, steady”. These reminiscences were probably written by Charles Buckwell (1905-91). He was at the King’s School from 1918-24 and won an Organ Exhibition to Oriel College, Oxford. He then went to Ely Theological College and was ordained. He was later Vicar of St Michael and All Angels, Croydon.